I've just never been able to get into shiritaki noodles. I came across the idea for protein powder noodles on a bariatric surgery forum and have been experimenting for a while ... this version isn't perfect but was good enough to share. Mix PB2, protein powder, egg white, and psyllium husk powder together until they form a thick dough. Let dough rest while you bring a pot with a few cups of water to a boil. Put dough between two sheets of plastic wrap and roll out until very thin (but not so thin it falls apart when you move it). Try your best to make it all the same thickness. Dust cutting board with a little protein powder, then peel plastic off the dough and lay it on the board. Use a pizza wheel or sharp knife to cut into lots of thin strips. Put noodles in the boiling water and turn the heat down slightly (otherwise it will foam up like crazy). Cook, stirring occasionally, for about 7 minutes or until noodles have firmed up to "al dente." Drain. 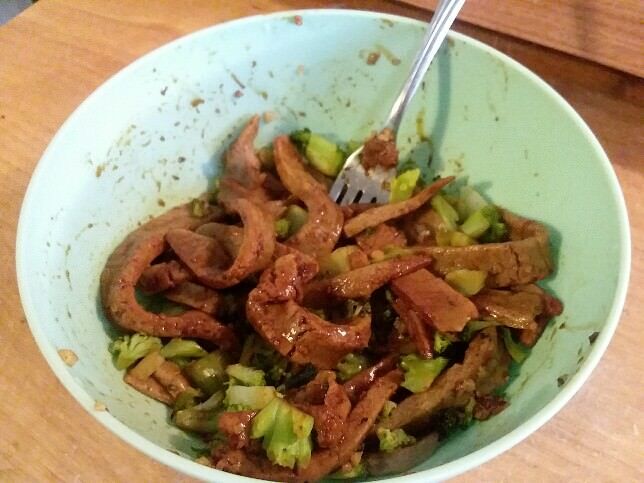 Macros (including everything but the veggies): 23g protein, 6g carbs, 2g fat.